Once again IITC has designed a first in the pain testing research field, the very first digitally controlled paw pressure meter. 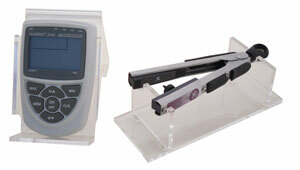 The unit allows the user to attain data for analgesic drug testing via the Randall Selitto method. This hand held instrument applies a force to the extremity of the test subjects. “Live” readings are provided of whatever force is applied at any moment with “Peak and Hold” showing the last maximum force applied during the test. Additional “Pressure Applicators” available. A footswitch is provided to reset the reading which allows “hands free operation”. 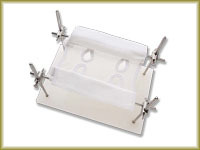 An acrylic stand comes standard with the equipment which allows easy viewing of information on the portable electronics. Power 9V battery (with approximately 50 hours of operation or the power adapter both supplied standard. Hand held probe weighs a mere three ounces with an accuracy of 0.5%. A test weight is supplied for accuracy check. No calibration required. Probe has a spring load for easy opening and closing of pressure applicator. To use the pressure applicator the probe is placed under the paw, close the pressure applicator, upon reaction the electronic unit will capture and store the pressure in grams to view and store. A flat surface is opposite of the probe tip to allow comfort and ease of operation. 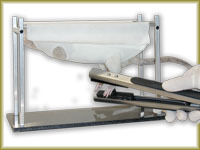 This test in our new form allows quick testing when the Randall Selitto method is needed.